This year got off to a slow start, but gathered energy as it went along. Over the past year we held regular Pleasant Sunday Mornings with speakers and displays, celebrated the name day of our patron saints, Sts Constantine and Helene, held a Gala Dinner to celebrate our 90th Anniversary and George Pappas was announced as Kastellorizian of the Year. The “Treasures from Kastellorizo” exhibition was held over two days, including a fascinating talk by Nicholas Bogiatzis, and brought many people to the Club, including young people. The Seniors met monthly either at the Clubrooms or at Restaurants and visited places of interest. 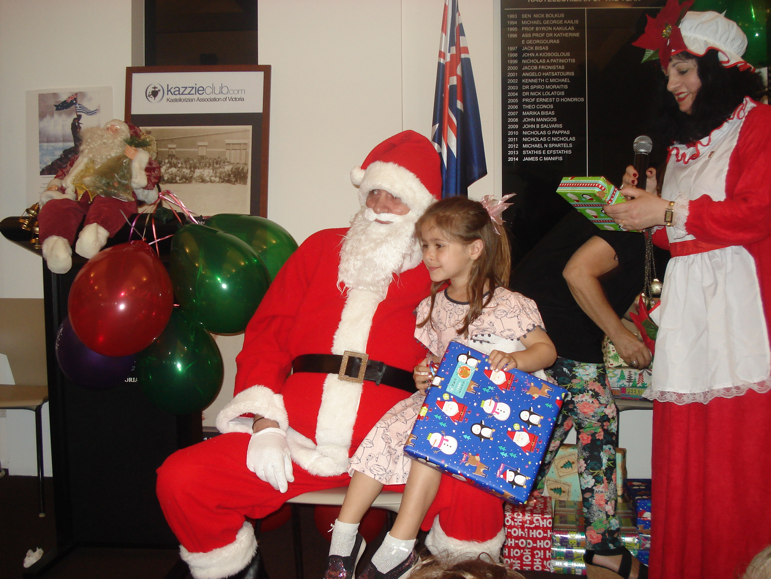 The Christmas party for children was a huge success, thanks to the hard work of the committee. We only managed one printed newsletter this year, edited by Fortis Josephides, who is unable to continue in that role, but we are aiming for two printed newsletters in 2016. To fill the gap, monthly E-Bulletins commenced in September, to a good reception, and these Bulletins will continue. At the Annual General Meeting, which was poorly attended, but lively, general discussion centred on the future operation and function of the Club. Lots of ideas were floated, including the perennial topic “What are we doing for our youth?” I can only say that the Club is totally focused on the future operation of the Club, and will endeavour to address the youth question. BUT a small committee of mature people can’t wave a magic wand to attract our youth, so please talk to the young Kazzies you know, ask for their ideas and think about what you as members can do, and put forward proposals that you are prepared to put time and effort into to bring your proposals to fruition. We will listen. As a first step in that direction we intend that the first of our Pleasant Sunday Mornings in 2016 will feature a young presenter and be aimed at our youth. The Kastellorizian Council of Australia will hold its inaugural conference in Brisbane 22–26 January 2016 (details below). In their latest update only two registrations are recorded from Victoria, with strong support from Western Australia and Queensland. Please consider supporting the conference. Sincere thanks to the committee for their support and hard work, and thank you to the members who continue to support us. If you are not a member and are receiving this E-Bulletin, please consider supporting the KAV by registering as a member. Special thanks to Florence Livery for her work on the Archives, and more recently for updating the membership database. More on this topic under Archives. Best wishes to you all over the festive season. 8 November. Florence Livery presented a lively talk on the KAV Archives, as well as a formidable display of documents, books and photos. Florence’s talk sparked lots of passion in the attendees for what she has achieved, and for what she obviously inspired them to do with their own family records. Of particular interest were the recently unearthed 1932-1951 Castellorizian Brotherhood Minutes, beautifully written in Greek. Florence feels that it is important that we find someone to volunteer to read the documents and prepare a brief summary in English. As a first step subsequent to her talk, Florence approached Beryl Georgakopoulos who undertook to translate the minutes of the AGM of the Melbourne Kastellorizian Brotherhood, held in March 1932. What Beryl had to say about the Minutes is quite extraordinary – “exquisite calligraphy written by a highly-educated person.” With Beryl’s permission, we would like to publish the transcription and Beryl’s comments when we next produce a printed newsletter. 29 November. Consensus was that the Children’s Christmas Party was one of the best ever, with lots of party food and a range of activities, and the presence of Mr and Mrs Santa Claus who handed out presents to very happy children. Great to see lots of Mums and Dads there with their children, and also proud grandparents. Great work by the organisers. 6 December. Thank you to those members who showed their support for the club and came along to the AGM. Items raised under general discussion will be followed up. The President reported that he had met with our Kastellorizian of the Year, George Pappas, and the Victoria University, regarding the setting up of the scholarship for a student of Kastellorizian descent. Mr George Pappas, Chancellor Victoria University, has endowed a new scholarship from 2016 for a student of Kastellorizian descent to attend Victoria University. Mr Pappas made his decision to establish the new scholarship as a way of giving something back to the Kastellorizian community, to honour his parents and to provide others with the opportunity to further their education. The scholarship provides financial support of $5000 for the first year of study for a year 12 school leaver undertaking an undergraduate degree for the first time. Applications are through the Victoria University’s Scholarship Office. If you would like an advance copy of the draft criteria and selection process, we can send you a copy. Contact info@kastellorizo.com.au with your request. Otherwise direct your enquiries to the Scholarship Office at Victoria University. After four years of painstaking work on the Archives, Florence Livery will relinquish that role to concentrate on several Kastellorizian historical projects which need her undivided attention. The Club has been extremely fortunate to have Florence as Archivist and we should all be very grateful for her efforts in maintaining and extending the Archives. She has put together and catalogued a treasure trove of information and records, artefacts, books, and photographs. More recently Florence also tackled the membership and email databases to bring them up to date. We all hold Florence in high regard and wish her well in her endeavours. We will sorely miss her. The Committee has decided to invite a member(s) to take on the role of a part-time administrator to maintain the membership databases and coordinate the Archives. Renumeration is offered. The position of Secretary is now vacant. We urgently need someone to take on this role. Expressions of interest from members are invited. It has been decided that a dinner will be held annually during which the Kastellorizian of the Year will be presented. At the AGM on 6 December, the President reported that the committee thanked John Karis for establishing and maintaining the club’s website for many years. A new website was designed and the response to the new format has been encouraging. There have been some hiccups with the new platform, specifically with integrating content and updating information, but nothing is insurmountable and we ask all members to be patient. We know there have been frustrations, but we are getting there. It is intended that the website will eventually provide easy access to news, membership subscription and the events calendar. Thank you to all the members who joined us at Mesh for our annual Christmas Lunch. It was a very happy day and raffle prizes were won by Kate Quinn (Patsoyiannis), Jane Paltos, Cherry Alexander and Sophie Manolis. Congratulations.
. We will meet next year at our clubrooms on Wednesday February 3rd at 11am for lunch. All welcome. February 14, 2016. The KAV is planning a joint picnic with the Ithacans at Ferny Creek. (See details below). If we have enough senior member interest, we may hire a bus. It will be bring your own chairs, food and drink. Please ring Christine on 95929450 or Peter on 9379 8635 for further details. The President of the Rotary Club of Kew, George Verginis, with a sub committee, organised a fundraising event – the Big Greek Charity Dinner. This was held on 6th November at Yianni’s Tavern in Melbourne, for the purpose of assisting in the provision of urgent medical aid to the crisis of 4000 refugees arriving every day into Athens. The Rotary District Governor and several other Rotary clubs supported the event. Money raised was for financial assistance to buy medical equipment, i.e. vaccines, bandages, surgical equipment etc as the hospitals are without funds due to Greece's financial crisis. Whilst their team of Rotarian doctors in Athens are volunteers, they are helpless when they have limited resources to help those with injury and health issues. $18,000 was raised and will be allocated in total for the purpose it was raised to assist, being humanitarian aid for the Rotary Clubs of Athens. 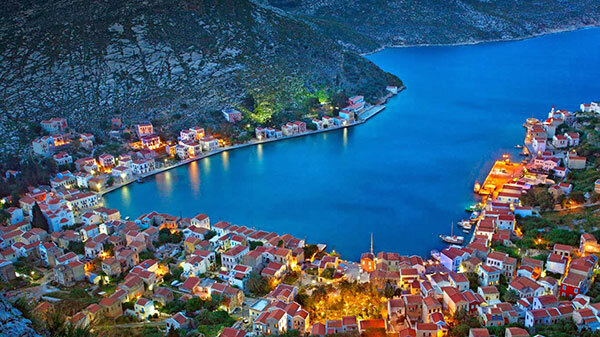 Image of Kastellorizo on Priceline Calendar. Legendary Kazzie-Australian soap actor Thaao Penghlis, of “Days of Our Lives” fame, has produced a new cookbook – Seducing Celebrities, One Meal at a Time, which is a best seller in America. There is lots of information about it on Facebook. One of our KAV members provided the publishers with a photograph of Katoumari, which appears in the book. The Santa Claus legend originated with St Nicholas who was the archbishop of Myra (in Asia minor, 50km east of Kas, which is opposite Kastellorizo) in the 4th Century. St Nicholas' chief patronage in the Orthodox church is that of sailors and ships, offering safe voyage. 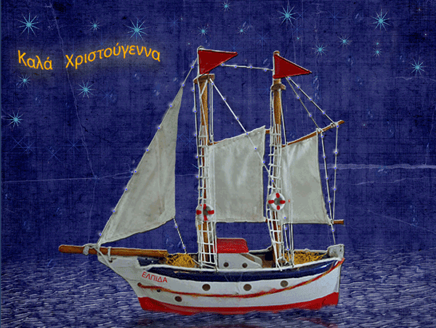 Many ports in Greece have icons of St Nicholas, surrounded by replicas of small ships made of silver or carved of wood. 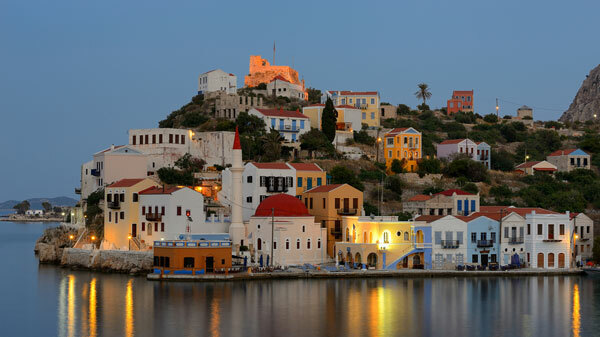 This most probably explains the symbolism of the boat that is used during the Christmas period on the Greek islands such as Kastellorizo. (Extracted from Wikipedia). 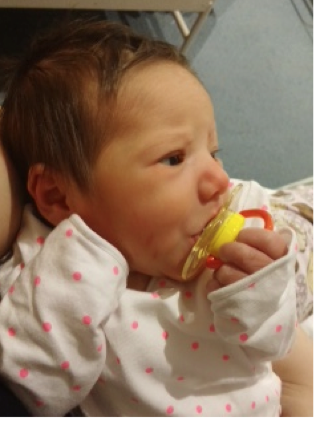 Jack Michael and Regine Miriklis, who married in December, 2013, are excited to announce the arrival of their Daughter Mia Sophia, born 3rd November 2015 at Cabrini Malvern. Mia shares a birthday with her Papou Michael Miriklis and was named after her Yiaya Markezina Miriklis. Mia is the first grandchild for Michael and Zina Miriklis and Chris & Rita Karantzas. Please mark your diary now. The Ithacan Philanthropic Society is celebrating 100 years in 2016. President Tony Drake (Antonis Drakopoulos) has expressed on many occasions over the years the wish for the Kazzies to have combined functions with the Ithacans. Members of the KAV are invited to join with the Ithacans for a family picnic at Ferny Creek on 14th February. The Ferny Creek Reserve will be hired by the Ithacans for the event. The Reserve has barbecue facilities and a large oval. There is also a hall in case it rains. There will be races and activities and many prizes for children and adults, and ice creams for all. There are ice creams given to all. In compiling and editing this E-bulletin, particular attention is paid to the correctness of information supplied, spelling of names etc, and the final copy is authorised by the President. Based on information provided, dates and details of events are correct at the time of publication, but the editor takes no responsibility for any omissions. The KazziE-Bulletin will take a break over the holiday season. The next bulletin will be issued in February.